A few days ago, I discussed a few of the artists exhibiting at the art show that was part of the Joint Mathematics Meeting in Baltimore. Here are my other favorites from that show. I have been a fan of Robert Fathauer‘s sculptures for years, but I feel Three-Fold Development is one of his best works. 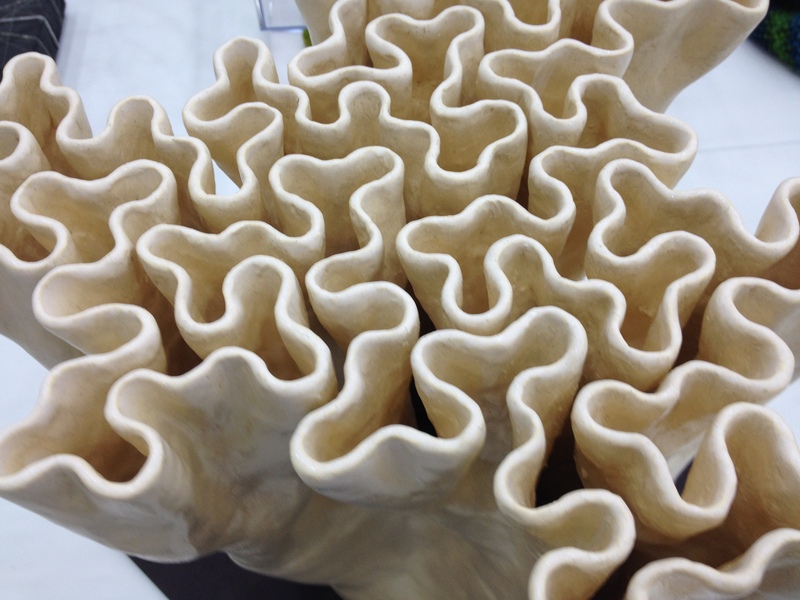 This ceramic vessel has a top lip sculpted to depict the development of a fractal curve through five iterations. Starting with a circle, then a three-lobed curve, then a nine-lobed curve. In each subsequent iteration the number of lobes triples.The sculpture has a wonderful organic quality, while still maintaining an elegant complexity. Fathauer has skillfully kept the spacing quite even between the ribbons of clay creating a graceful relationship between the positive and negative space. Mathematics enthusiasts have been fascinated with Magic Squares for centuries. Magic Squares are grids. Each grid square contains a number. The grids are constructed so that the sum of the numbers in each column, row and diagonal of the square are equal. Margaret Kepner‘s Archival Inkjet print “Magic Square 8 Study: A Breeze over Gwalior” is a an intriguing representation of a Gwalior Square: an 8 by 8 magic square which contains the numbers 0 to 63. The sums of the rows, columns and diagonals all add up to 252. Kepner has translated each of the numbers 0 to 63 into graphic patterns using her own system, and formatting the numbers in either base 2 or base 4. The resulting print has a great optical effect of patterned color block grids that are both horizontal, vertical and across the diagonal. 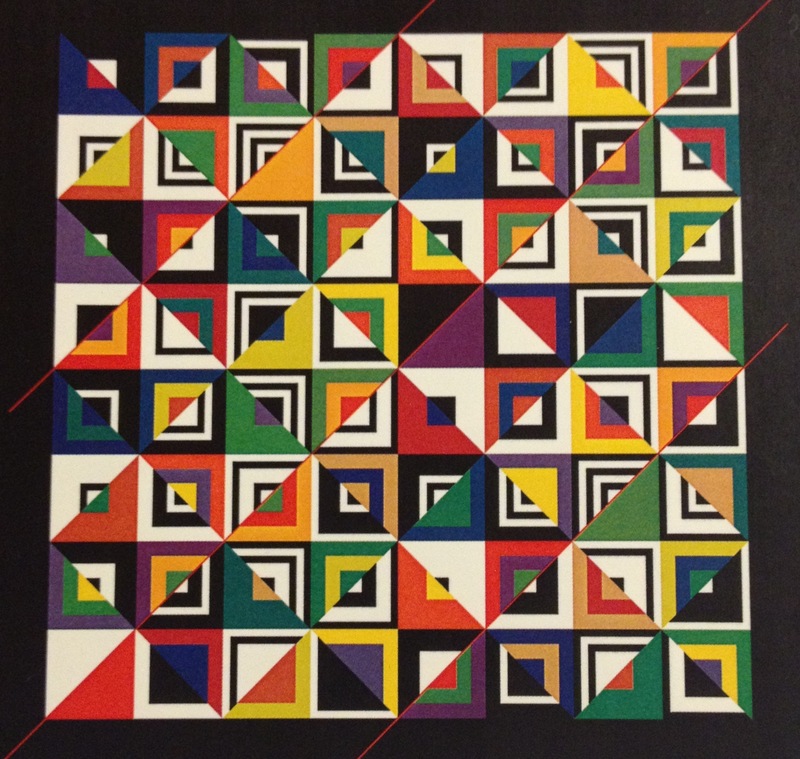 It reminds me of a Modernist quilt or a contemporary twist on some of Al Jensen’s paintings that resemble game boards. Kemper refers to her artistic process as “visual expression of systems”. I think that this print goes beyond merely expressing the Gwalior Square it celebrates the Mathematics in a bold field of shape and color. At the Art Exhibition at the JMM conference quite a bit of the art was digital printing on paper. Petronio Bendito – in contrast – prints his work on canvas, giving the prints more of a painterly feel. Bendito has developed algorithms to define his color palette, but there is also an element artistic expression in establishing the final images.”Color Code, Algorithmic lines n.0078″ is so vibrant that it beckoned me from across the room. Bendiito’s use of color and line creates a cacophony of bright straight and curved thin ribbons of paint. The use of the black background makes the exuberant frenzy of color jump out to the viewer. Lilian Boloney is a textile artist who uses crocheting to explore the geometry of hyperbolic figures.There is an elegant simplicity to the off-white cotton thread she used to crochet the sculpture “Boy’s surface”. This allows the viewer to explore the complex topology of the figure with out the distraction of patterns or color. Boloney not only has a clear understanding of her Mathematical subject, but she transposes their beauty into graceful objects. 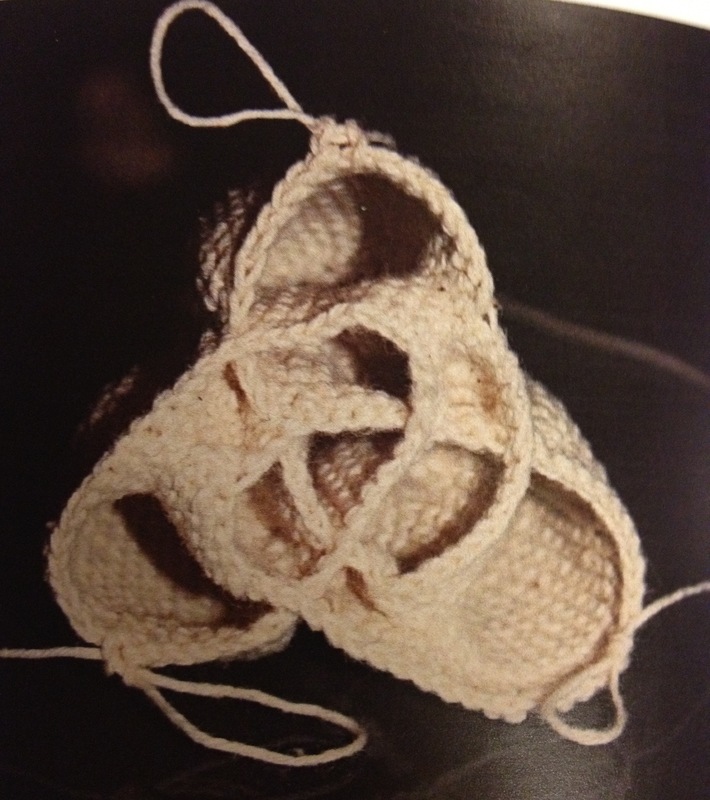 Instead of models of Hyperbolic figures I see them crocheted portraits. I hope you enjoyed the samples of work from the JMM exhibition as much as I did. 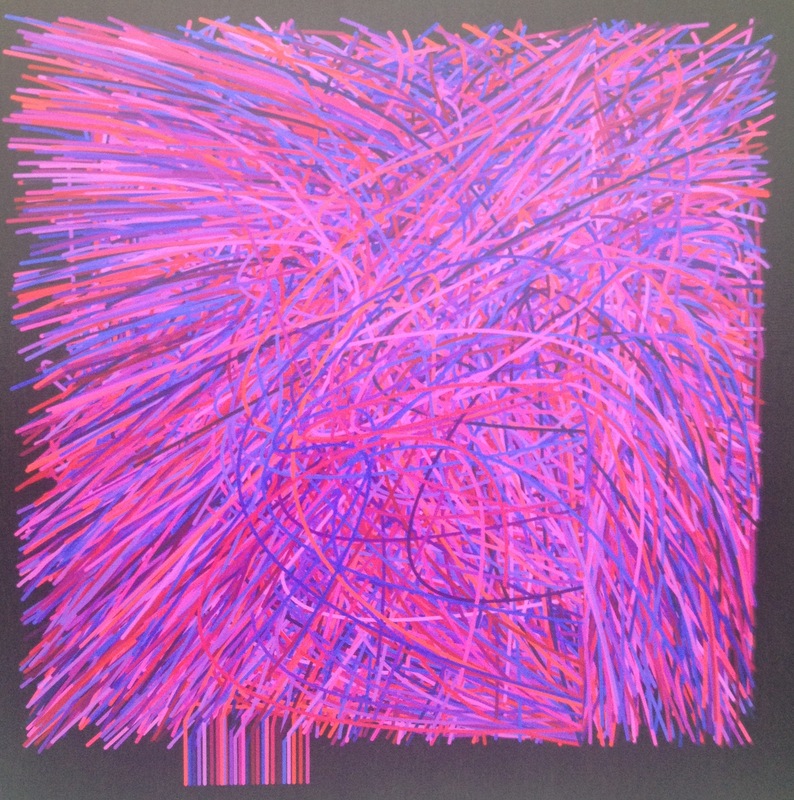 The Art Exhibition at the JMM conference was organized by the Bridges Organization, an international organization that promotes the relationship between Art and Mathematics. Each year they have a conference where Mathematicians, Artists and educators meet to discuss, explore and learn about Math Art. This year’s Bridges 2014 conference will take place in August in Seoul, South Korea. This is the first Bridges conference to take place in Asia. It is a wonderful opportunity. I encourage all artists who are interested in Mathematics to attend and participate at this conference. The deadlines for paper and art submissions are fast approaching all info is on the Bridges website.